'Solitude' is a condition that I'm well-acquainted with as of late. I've been back at the apartment since last Sunday and have the place to myself. Not only that, I have more or less all of grounds to myself, save for those poor, overachieving, GPA-boost-seeking souls here for J-term. As for me, I'm here working part-time, which is actually getting me nowhere whatsoever since I spend every waking hour that I'm home with my feet propped up on a table laid with half-read books, a carelessly discarded PS3 controller in desperate need of charging, and the Mac open to tabs of Facebook, Tastespotting, and Amazon.com for easy-access online shopping. In any case, "solitude" has never been a word I've found melancholy or deplorable, or one associated with the social status of an elderly cat-lady. In fact, I love being alone. It's a characteristic my mother has found baffling ever since my toddler years, when I was perfectly content to sit by the window in my crib and engage in whatever musings strike a 2-year-old without the need to cry out for mom's attention or caregiving. I'm not sure why, but I just rarely feel lonely, and very much enjoy having hours upon hours to spend doing whatever I want. Lately, that has been books. Now, I'm not one for new year's resolutions. I mean, I make them, in my head of course, with all intention to break them as quickly as possible and save myself the later self-loathing. So, in an effort to keep up tradition, I mentally drew up a list of unachievable resolutions. The list included the usual - lose 20 pounds, will myself to sleep earlier than 3am on weeknights, do a better job of keeping in touch with family, etc. etc. But I also made one serious resolution that I do actually intend on keeping: read more. I mean, I realize that it has only been 8 days, but having read literally about 1,000 pages of literature since the start of 2012, I think I'm doing rather well so far. In any case, it's more than I'd read for pleasure during the totality of the 365 days of 2011. Currently I'm in the middle of George R.R. Martin's Game of Thrones and absolutely loving it. I work my 5-hour shifts every morning, come home by 3pm, and spend the remainder of the day alternating between novels and BBC television. Today, though, has been a bit lazy. I haven't actually read at all yet, and spent the morning cooking, submitting philosophy papers to random journals, reading up on summer internships, and baking. 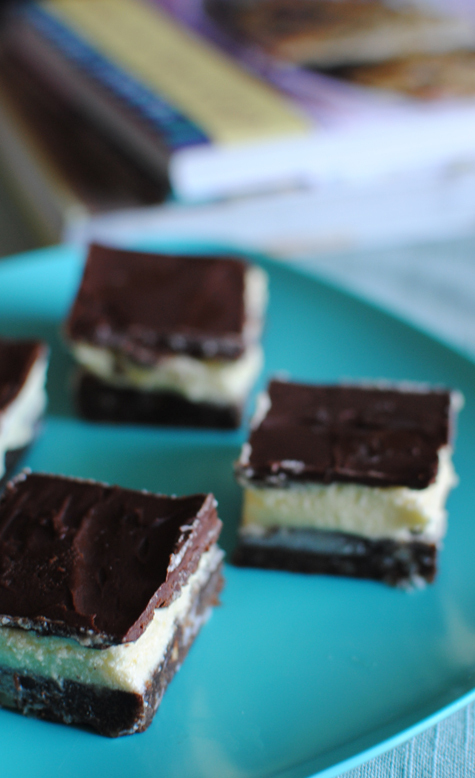 First time baking in a little while, and so I settled on something I've always wondered about: nanaimo bars. 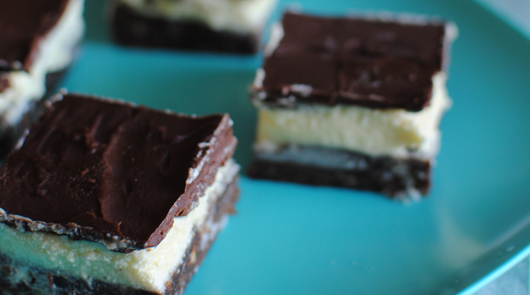 Nanaimo bars are a delightful little treat from one of my favorite countries in the world, Canada. I actually did not realize prior to actually making them that they don't actually require any baking. [This was, in fact, so surprising that I felt the need to use the word "actually" thrice in the previous sentence.] Instead, they just chill out, layer by layer, in the fridge until they settle. It's a rather casual baking experience, which was even more welcome since I've tried my very best to move as little as possible today. The end result is a bit sweet for my tastes, but undeniably worth it for the ease of preparation. Line an 8x8-inch square pan with aluminum foil, but do not grease. In a medium, heat-proof bowl, melt butter, brown sugar, and cocoa over a double-broiler [or microwave]. While the mixture is hot, whisk constantly while slowly pouring in the beaten egg. Be vigilant about whisking as to avoid scrambling the egg. Switch to a wooden spoon, add in graham cracker crumbs, walnuts, and coconut, and mix until the mixture comes together in a sort-of dough. Dump the dough onto the base of the pan and press it evenly along the base. Stick the pan in the fridge for 45-60 minutes. Cream the butter, powdered sugar, and custard powder in a bowl. Slowly pour in the heavy cream and beat on medium speed until light and fluffy, about 5 minutes. Pour filling onto the chilled crust and spread evenly with a spatula Stick the pan back into the fridge for another 45-60 minutes. 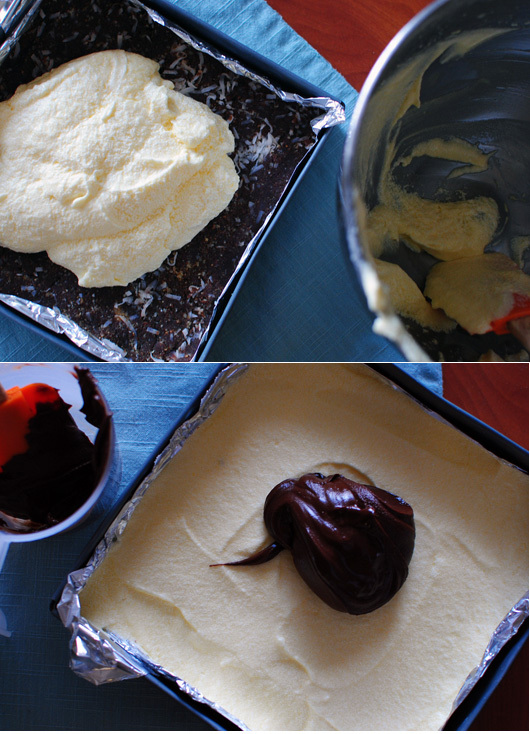 Melt the chocolate chips and butter in a heat-proof bowl until the mixture is smooth and shiny. Once the middle layer has firmed up, pour the chocolate on top and spread it evenly with a spatula. 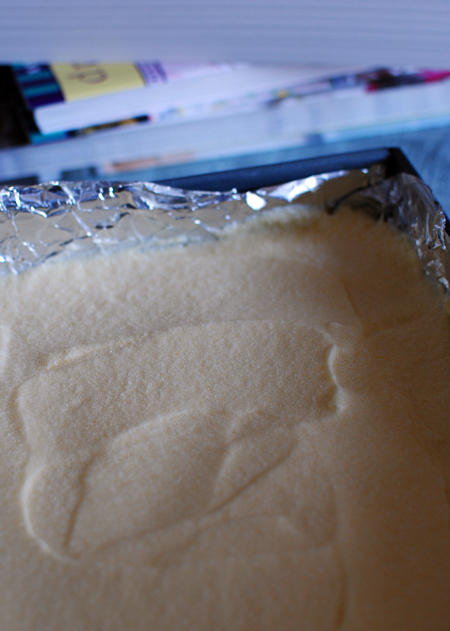 Chill the bars in the fridge for at least 60 minutes before removing from the pan and slicing. Cut into 16 squares and serve. Bars can be refrigerated for up to 5 days. As for the bars themselves, I love the crust on these; it has everything I love about an unhealthy food item. Graham crackers, nuts, coconut, butter, and brown sugar. I mean, it really just doesn't get any better. The middle layer I'm less keen on, but it's more a fault of my personal character [I don't like the taste or texture that accompanies custard powder] than the actual bars. But sandwiched between such a delightful crust and a guaranteed-to-be-delicious ganache layer, I couldn't stop myself from nibbling on the bars as I sliced them up. A fine dessert, over all. As I said before, I have no problem with solitude. I rarely feel lonely and am perfectly content being able to sit like a log on my sofa in PJs for the entirety of the day with nothing but my books, my BBC Sherlock, and my David Tennant to keep me company. But when one has the house to herself, one also runs into the problem of having all of one's dessert to herself. This may not seem like a bad thing to those not in the house who may actually want to partake in said dessert, but for the one all alone in the house, it is a bad news bears situation. Consequently, I've layered the bars up in some tupperware, stuck them in the freezer, and plan on taking them home with me when I head back next weekend to share with the family. Of course, that's not to say that I've kept a couple in the fridge for some dessert after tonight's dinner, but no one has to know about that. bߋokmarked! !, I really like your site! possible for you to to turn your focus and focus back to other areas of your life your profession, your training, and your relationships. striking the current market. Also to finish everything off you may wish to start getting some sort of physical exercise.